It’s almost Oscar time and the buzz is, well, buzzing. So far this year, the five best pictures I have seen, in no particular order, are: The Grand Budapest Hotel, A Most Wanted Man, Boyhood, Guardians of the Galaxy, and now Birdman. Each film has a strength and a weakness that could keep it from winning or from even getting nominated for Best Picture. Grand Budapest is visually & comically amazing, but it’s a quirky Wes Anderson film, which the Academy doesn’t seem to enjoy. Most Wanted Man is perfectly restrained, but lacks in-your-face drama. Boyhood is the year’s best piece of art, but it’s also slow and uneventful. Guardians is the most entertaining thing you’ll see in 2014, but it’s a sci-fi action/adventure movie and so has no chance. And lastly, Birdman, which is wonderfully strange but could be seen as somewhat exclusive. Any of these five films could take home the top prize come this awards season, but that’s assuming they don’t get beat out by the anticipated films that haven’t yet come out: The Imitation Game, Unbroken, Interstellar, American Sniper, The Theory of Everything, Foxcatcher, Nightcrawler, or even a few already released like Kill the Messenger, Fury, Gone Girl. 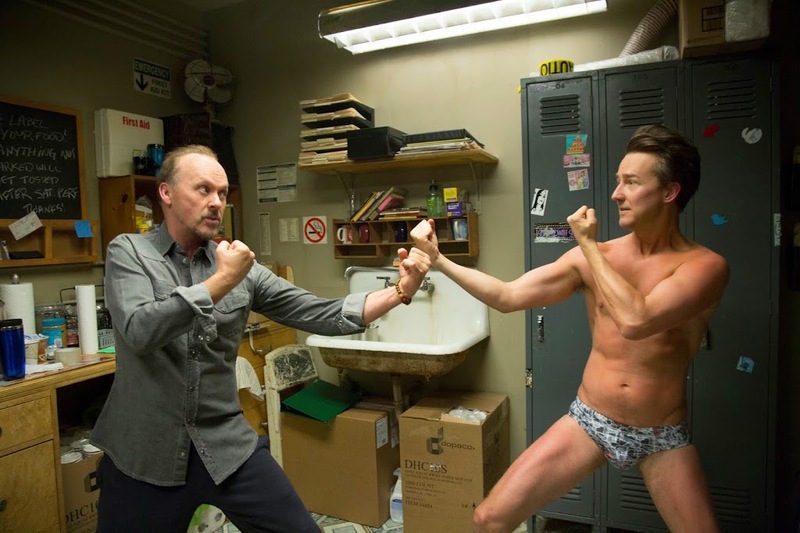 Anyway, to get back of track, for my money Birdman is not just a contender but one of the best films of the year. Birdman was a tremendously popular superhero years ago, leading to a franchise of films that made Riggan, the man behind the mask, an A-list celebrity. A house is Malibu, a cult following; Riggan had it all. But that was long ago, when he was young, and before he decided to attempt to be a serious actor. His fans are still out there and would leap at the chance to see Birdman return to the screen, but Riggan is on to new projects now. On Broadway, he is attempting to adapt, write, direct, and star in a hit new show that he hopes will reboot his career. But the theatre is a wild backdrop for emotionally unstable inhabitants, a world that Riggan knows little about and is about to be crushed by. His costar, Mike, is a over-talented diva who assumes he can do no wrong. Lesley & Laura, the female leads, are about as unstable as actresses can possibly be. Riggan’s best friend and jack-of-all trades Jake desperately tries to keep the show together, while Sam, Riggan’s daughter, is back from rehab and trying to become an assistant. And oh yeah, by the way, the voice of the old Birdman is haunting Riggan whenever he is alone, speaking to him as if the alter-ego were real, pressuring him to sabotage the play and return to the big screen. The next few days before Opening Night are going to be interesting, as all the characters involved both on & off screen seem to be losing their minds all at once. Break a leg! If that summary doesn’t pique your interest I don’t know what will. As someone who has been involved in theatre on a very small level, the play-is-about-to-begin plot line is an exciting one for me. There is so much inherent drama happening backstage before & between every show, so many characters interacting in frequently unhealthy ways, that the stories write themselves, the action is there for the imagination to capture; basically the theatre is a perfect place to set a film. It can go horribly wrong and has, just watch A Prairie Home Companion, but it can also work marvelously well, as it did with Noises Off. Both of those films are a bit more comedic than Birdman, but both showcase the madness we never see when sitting down in an auditorium, and that feeling is captured here as well. The characters combine to bring us along on a wild ride, a series of ups & downs that exhibit the free-wheeling nature of the theatre. It’s funny, fast-paced, eventful, surprising, and well produced, an over-the-top spectacle, a movie about a play, a comedy of errors, and entertaining look at a stressful & enviable life. But that’s just part of what makes Birdman great. Left alone, the amusing first half of the film could have been a cool movie, a comedic look at life behind the curtain, a farcical romp crafted to enjoy. The second act, however, brings a much darker element into play, elevates the quality of the film, and adds another level to what began as solely entertaining. 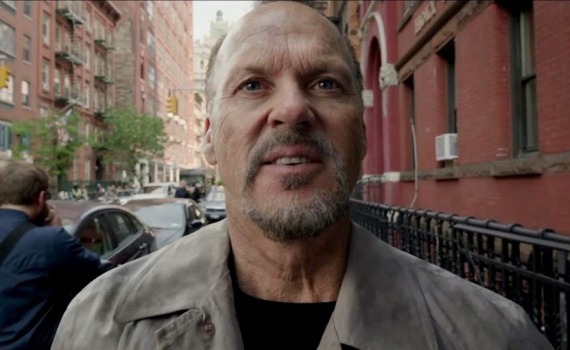 Michael Keaton, playing a man who takes everything on to his shoulders, carries the complicated load of being Riggan the actor & Riggan the Birdman. He is a character that’s difficult to understand completely, a man trying to hold on to the past and yet transcend it, to become something more while being afraid to leave his safe perch. Sounds a bit dramatic perhaps, but Keaton makes it natural, he forces it to seem real in our eyes, even when talking to a poster of his former self. But Birdman can’t do it alone, he needs a Robin, or maybe in this case a Flying Squirrel, I don’t know, but someone to balance him out. And that’s where Mike comes in, or Ed Norton, for they both steal their respective shows with their talent, while simultaneously supporting the casts around them. This is the best I’ve seen Norton in a long time, while the same can be said about Emma Stone, who I actually don’t like but was impressed by in this film. Everything comes together with a magical ease; the comedy, the tragedy, the reality, the wild imagination, and of course the incredibly well-acted characters. Birdman is a film that delivers its ideas in perfect balance, a movie that deserves every honor it will most surely receive.